Penguin Perry wants an ice scooter, but needs nine clams he needs to buy one. He decides to do odd jobs to earn the money and uses a line graph to track his progress. Unfortunately, he seems to lose and spend as much as he earns! Will Penguin Perry eventually earn enough? 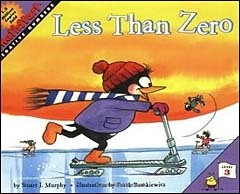 The main purpose of this Math Start story book is to help teach negative numbers, but since Penguin Perry graphs his progress toward his goal, this is also a helpful title for teaching graphing. Thus, while this is not one of our top picks for children's books about graphing, if you plan to teach negative numbers and graphing, this book will do double duty quite nicely! And, as with all MathStart books, the final spread includes discussion points for your read aloud and extension activities about graphing and negative numbers. Below are sample spreads from inside this book--showing the very cute illustration style, the general amount of text per page, and the graphing focus in the book. To see larger version of these sample spreads (the first three in the book), please click on the images.